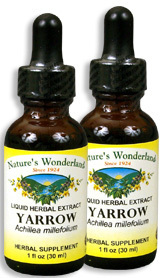 Yarrow Extract, 1 fl oz / 30 ml each (Nature's Wonderland) - Penn Herb Co. Ltd.
Once known as "Military Herb" because of its use on the battlefields, today the Yarrow plant can help you in your fight to stay healthy. Our fast-absorbing extract provides traditional immune system support as well as promotes healthy digestion. Yarrow's astringent properties help to tone the mucous membranes of the stomach and bowels. As a bitter tonic, it promotes healthy function of the digestive system and supports healthy liver and gallbladder functions. Yarrow's other therapeutic compounds act to bolster immune health, especially during the change of seasons. Find this nutrient-rich tonic in the following formulas: Nature's Wonderland's Healthy Liver & Gall Bladder Support™, Catfish Bitters™, and the soothing Olbas® Instant Herbal Tea. ALSO KNOWN AS: Bloodwort Milfoil (French), Herba militaris (Military Herb), Milefolia (Spanish), Nosebleed, Soldier's Woundwort, Thousand-Leaf. AMOUNT PER SERVING (333mg/ml or 30 drops): Ethically Wild Harvested Yarrow Flowers and Leaf (Achillea millefolium). OTHER INGREDIENTS: Grain Alcohol (40-50% by volume), Deionized Water. Free of: milk, dairy, egg, fish, shellfish, tree nuts, peanuts, wheat, gluten or soy. Herbal astringent; maintains healthy liver & gallbladder function; supports immune health; promotes healthy digestion; promotes blood cleansing; eases menstrual cramps. 10-30 drops in water or juice, 2-3 times daily or as needed. DO NOT TAKE DURING PREGNANCY. Shake well before using.